What is the single most important end times sign? Bill Salus: Among those signs of the end times, the second question you asked the Living on Borrowed Time panel was, "What do you consider to be the single most important sign of the times, and why?" Dr. Reagan: Yes, I decided to zero in on finding out what the single most important sign of the times would be to those Bible prophecy experts, thinking that probably they would give the same answer they gave to question one — the return of Israel as a nation. But, that wasn't the answer at all. Question one was answered, "Yes, we believe we are in the season, but it is all because of the convergence of all of these signs." And, when I got to question number two, I asked, "What do you consider to be the single most important sign of the times?" Well, overwhelmingly people historically point to the re-establishment of Israel in 1948, but now they mention other things, such as the decay of society and the upheaval in the Middle East, and things of that nature. The majority continues to focus on the re-establishment of Israel. Bill, you also know how true that is, because end time Bible prophecy focuses on Israel and the Middle East. Nearly 500 years ago, the Puritans began to study Bible prophecy in detail. From that study, they began to believe that Scripture means what it says. You should take Scripture for its plain sense meaning. The Puritans also began to say the Bible says that in the end times the Jewish people would be regathered from the four corners of the earth and the nation of Israel re-established. Those of us who take Bible prophecy to mean what it says have always believed that. It's wonderful to go back into the 19th Century books that were written then by people who believed Bible prophecy, and also in the early 20th Century, and they said over and over that the Jews are going to be regathered and the land of Israel is going to be re-established. People just laughed at that claim, and mocked and jeered at them. Some people continued to mock even up to the very day of May 14, 1948, when the nation of Israel was re-established. So, they claimed, "Israel won't last a week because it's surrounded by 250 million Muslims who are going to come in and destroy the new nation." The nations have tried over and over and over to eradicate Israel, but Israel is still existing to this day. Bill Salus: As a matter of fact, David, in your magazine, The Lamplighter, you deal with this very subject. Proof of God's existence comes in part through Israel's ongoing role in Bible prophecy. Israel and Bible prophecy is a fantastic proof for God's existence. I really enjoyed the article. There are evidences of the existence of God due to the rebirth of the nation of Israel, which fulfilled many prophecies, along with Israel's reclamation of the barren land. Take just a moment to talk about some of the highlights on how we can prove God's existence. Dr. Reagan: All my life I've been told that there is no way you can prove the existence of God. You just simply have to come to a point where you take a leap of faith and you believe that God exists. People then "leap" for various reasons. It may be because of the complexity of life, or the nature of Creation, or whatever. Just about a year ago, I read a remarkable book by Carl Gallups, a pastor in Florida. His best-selling book is called The Magic Man in the Sky. He has been debating Atheist for some time now, and that's what they call God — the magic man in the sky. He points out in this book that God is neither a magician, nor is He a man, nor does He reside in the sky. The thing that gripped me about Gallup's book was about mid-way through he claimed he could prove beyond a shadow of a doubt that God exists. The way he did it was by using Bible prophecy concerning the Jews. It suddenly occurred to me, he's absolutely correct! You can take the Bible and read what it says, prophecies written 2,500 years ago and even longer than that, about the end times. They are very specific prophecies. They're not vague. They're not general. They're not babble like the prophecies of Nostradamus. Instead, these prophecies concerning the Jews are very specifically detailed prophecies. They say that in the end times the Jewish people will be scattered all over the world, but that then they will then be regathered and their nation will be reestablished. They will re-occupy the city of Jerusalem, which occurred on June 7, 1967. Also, the land of Israel will be reclaimed. For the 2,000 years the Jews were banished out of the land, the land became a desolation that nobody wanted. All the trees were cut down. It became a barren wasteland of malaria infested swamps. And yet, the Bible says very specifically in Ezekiel that when the Jews come back into the land, the land will become like the Garden of Eden once again. That's exactly what has happened. The Bible talks about the revival of the Hebrew language, which has occurred in the last 100 years. Prophecy talks about Israel becoming a super power in terms of military power. They will devour all the nations roundabout who try to attack them. The Bible tells us that all the Arab nations will try to attack Israel and try to take Israel's land from them. The Bible contains specific prophecy after prophecy after prophecy, all of which are being specifically fulfilled in great detail in our day and time. The only way that you can explain that is that the Bible must have supernatural knowledge, and that supernatural knowledge must of come from the Creator of the Universe. Bill Salus: David, you take a lot of tours to Israel. I went for my first time recently and I was just fascinated, for I got to see these prophecies alive and in the flesh. 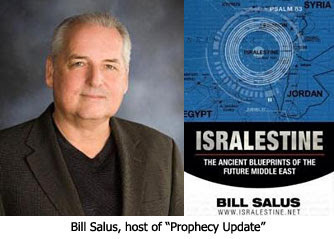 In the third segment of my interview with Bill Salus concerning the converging end times signs, we'll discuss what many Bible prophecy experts believe is the second most important end times sign. I guess your conclusion that Israel and the end times are connected is based on the belief that "Israel" means "Jews", which is quite a misconception. "Israel" harks back to Genesis 1:27 with the creation of those blessed by G-d, while Adam and Eve were still in preparation, before the creation of Adam and Eve several verses later. Yep, only two individuals to start is also a misconception. There were six to start in 1:27, then two made from dust and bone. If you get Genesis 1 wrong, then you can't possibly make sense of the rest of the Bible. Why do you type God as G-d? I always think of things in the Bible with two things in mind. One: God gives the physical things of the world to....Two: represent the spiritual things of heaven, ie the celestial. So Israel is a physical people & nation that will fulfill all God has ever planned for them & Israel is the Church and all that it represents in the spiritual. Just start taking a look: other example exist everywhere in the bible. Noah & the Ark, Daniel & the Lions& most importantly Jesus & the Cross. ALL physical events that represent spiritual acts. God Bless!